My object for the final project is the picture frame with photographs of Ellen Sweet and her brother George Clark Sweet, decorated with walnuts. It is currently collected at the Mount Horeb Historical Society in Dane County, Wisconsin. The date that the object was made is around 1871 to 1933. The reason why I chose this object is the materials of the decoration on frame are unconventional, which are sliced walnut or butternut shells glued to the wood frame. At the back of the frame, there is a handwriting note in black ink reads: “George Clark Sweet, and his sister Ellen, who is mother to John Sweet Donald. These pictures were taken in 1867-1871 respectively. Madison Wisconsin Dec. 25, 1933” And there is a second note, in blue ink, reads: “Given to John S. Donald by his mother 1933.” Ellen Sweet Donald Jones gave the frame to her son John Sweet Donald (1869-1934) in 1933. The maker of the frame might be Ellen or by her daughter-in-law Vona DeCrow Donald. Another particularity of my object is that it is both the “container” and the “contained”. In my paper, I would investigate both the “container” and the “contained”. For the “container” — photo frame, I would examine the three stages of its biography and fluid social lives. Through exploring the hand-making technique, I also found the limited role women played in the society at that time. For the “contained” — portraits of Ellen Sweet and George Clark Sweet, I would discuss how the photography tells us about the technological and intellectual development at Mount Horeb and how fashion proves that material objects are status symbols and social markers that have categorical functions and expressive functions. The history of Mount Horeb can be traced back to late 19th century. Most of the settlers there were of English and Scottish descent. During the early days of Mount Horeb, the main industries were cheese and livestock. In 1855, the Sweet family moved from New York to live in Wisconsin on the farm. The figures in the photographs, Ellen Sweet and her brother George Clark Sweet, are two of the seven children of William Sweet and Sally/Sarah Clark Sweet. Ellen married John Strong Donald in April of 1868. Within a year John Strong Donald did from Typhoid at the age of 26. Then Ellen married John Jones, Jr. in 1882. The frame is something that Ellen gave to her son John Sweet Donald in 1933. The frame intends to display and protect the photographs in it, which also functions as a way to record the family history. Furthermore, the picture frame indicates that women’s work was mostly restricted in domestic space during the late 19th century and early 20th century. The possible makers of the frame are Ellen or her daughter-in-law Vona DeCrow Donald, both of whom are women. The walnut shell picture frame is not a mass-produced consumer product, but a hand-made craft that most likely made at home or a small studio place. Many women in the 19th century mainly carried out home-based work and in addition, they were also responsible for the unpaid work at home like cooking, cleaning, child care and often keeping small animals and growing vegetables and fruit to help feed their families. During the second half of the 19th century and early 20th century, woman started to work in textile factories, coal and tin mines or farms. The picture frame is a historical source that records women’s engagement in a variety of social activities. In the book, Woman and the Material Culture of Needlework & Textiles, it states that “the needle has been a as a vehicle for women’s own construction of alternative discourses, discourses with eh potential to expand women’s discursive worlds and the power they wield over their own lives” Here, the frame is also a vehicle for Ellen or her daughter-in-law to show the gender’s construction by the dominant discourse. Women’s craft has been always a performance of femininity. However, although women’s work expanded to a larger range from 19th century to 20th century, the role of women was still limited to domestic work like doing hand-making craft works. Unlike today’s society, women and men’s roles were sharply defined and had clear boundaries in social activities at that time. Women were more suited to the domestic space for a conventional perspective. Despite its maker, the frame itself also has great values to conduct the material culture studies that help us understanding the larger context and relationship between human, nature and society. By applying the biography approach to the frame, I focus on three phases during its social lives: raw material, family possession, and museum collection. Since the biography approach mainly focuses on the exceptional characteristic within its own time, thus those stages are characterized by the use of natural resources, particular human connection, symbol of local identity respectively. Recent conceptualizations of material culture studies hold the view that objects have ‘social lives’ (Appadurai, 1986) or ‘biographies’ (Kopytoff, 1986). Material objects have biographical turning points or stages in the life cycle. The turning points or stages of the photo frame evolve over time and the meanings and interpretations attached to it also flexible and fluid. Here I apply the biography approach to explore the different phases of the photo frame’s social lives. This approach traces a complete life story in an infinite time frame and highlights the exceptional and unusual features. Before the photo frame was been made, the walnut shells and wood frame were just raw materials in nature. The uniqueness of the first stage of the frame is its origin from nature. In Marcinkus’s book Nature Fancywork, she mentions that both Aristotle and Plato considered that nature’s purpose was to serve those with an intellect. Nature and humanity were part of a whole living organism. “Organismic theory emphasized the interdependence among the parts of human boy, subordination of individual to communal purpose in family, community and state, and vital life permeating the cosmos to the lowliest stone,” argues Merchant in The Death of Nature (1980: 1). Exploring natural resources is a way to study the laws of nature, by which nature becomes something that people can conquer, discover and exploit. The use of walnut shells can be seen as something unified human and nature. The portrait and walnut shells organically integrate together, which signifies a bond between human society and wild nature. Moving to the next stage of its biography, the frame became a memorial decorative object for the Sweet family after processed by hand-making techniques. The value of the object mostly lies in the human connection attached to the people in the photograph and the Sweet family. In the article by Sherry Turkle called The Things That Matter, she found that the photograph of her mother serves as a clue to her possible identity. The walnut photo frame also has the same function that builds a connection between the person in the photograph and the rest of the family members. 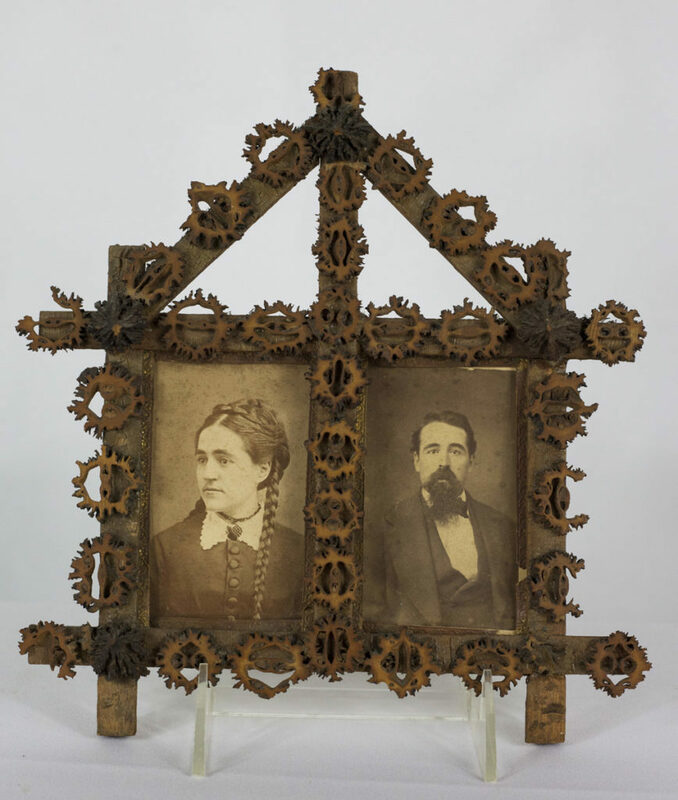 The materiality and physicality of the picture frame make it a vehicle for the family members to sense the family history and conclude the possible identities of themselves. Thus, the photo frame became the thing that mattered. The photo frame carries both ideas and emotions. Thought and feeling attached to it are inseparable from our study on the material object. Finally, now the frame is one of the museum collections at Mount Horeb Historical Society. Its value transformed from personal human connection to the symbolization of local identity that is precious for historical archaeologists to study the local and regional history. The estimate date of the frame shows that it was made 20 years or more later after the Sweet family settled in Wisconsin. In American art history, immigrants prefer to carry something precious like luxury goods or portraits to show their social status and identity. However, according to its time, the frame must not serve as something that the Sweet family eager to reveal their status and identity as new immigrants but as something functional and practical to the family. So the frame contains lots of historical evidence of the family and the region at that time. Now, as a museum, it can point toward to the artistic, cultural, scientific and historical facts of Mount Horeb, which speaks to its local identity and regional history. According to Erving Goffman (1951), there are two principle roles for status symbols. First, status symbols have categorical functions in that they serve to ‘distinguish’ and ‘socially place’ the person who uses the symbol. So the frame and clothes serves as symbols of social and economic status. The frame, as a decorative object, is not a necessity goods, which indicates that the Sweet family was not under poor living conditions that needs to struggle with necessity goods. However, at meantime, the material of the object, walnut shell, is not considered as a luxury goods, so we can infer that the family might has a social and economic status as a upper middle class. Secondly, status symbols can serve expressive function related to a person’s style, taste or cultural values. The shape, color and materials of the frame all have expressive function that we can see how the personal style, taste, and value embody in the material object. The shape of the frame is seemingly a house. It might be the notion of a unified family or any other harmonious living environment. The style of the frame conveys a taste of simplicity and rusticity from the Sweet family. And the use of natural materials like walnut shells and wood may suggest their embracement to the nature and wild. Material objects are also markers of aesthetics and cultural value. The clothes in the photograph also reflect the aesthetic and culture trend at that time which is “appropriate European styles in American subject matter”. During the early days of Mount Horeb, there was a rapid growing of European immigrants population due to the overcrowding in European countries. And it might be a historical explanation of the clothes that Ellen Sweet and her brother George Clark Sweet wearing in the photograph are heavily European-influenced. The tall collars that Elle Sweet was wearing are one of the features in the 1890s fashion, which is one of the fashion trends in Europe. In the 1890s, women’s fashion in America became simpler and less extravagant. American was in its “Gilded Age”. During the period, those Americans who travel to Europe tend to apply the European styles in American artistic forms like architecture, paintings, decorative arts as well as fashion. The clothes that George was wearing are the common trend shared by America and Europe, the shirts of linen or cotton with collars and neckties tied in a bow. Those elements are gentlemen at that time were often seen with. The photographs in the frame of Ellen Sweet and her brother George were taken in 1871 and 1867 respectively. During that time, photography was mainly documentary to capture real objects like portraits, landscape, and historical events. Photography did not step into the artistic venue until the 1900s. Thus, the function of the photograph of Ellen and George was used as a memorial portrait that can last long and be seen by generations of their family and the society. We can also infer that camera was been used by middle-class people at that time. Also as an new invent, telephone was just brought to Mount Horeb in 1895 by J. N. Dahlen, editor of Mount Horeb Times. The new technology and electronic devices like camera and telephone contribute to the popularization of communication in the community. By investigating the photograph, we can conclude that the photo frame is not only an indicator to the Sweet family history but also to the industrialization and technology development of Mount Horeb at that time. Growing interest in communication through visual imagery or sound influences the later development of Mount Horeb in a profound way. “If you want to know your future” said Winston Churchill “look backwards first”.’ Material culture can record the history that has significant meanings to future generations. Both the “contained” and “container” of the frame carries valuable artistic, cultural and historical significance to the family, the region and the anthropological study of human society. Woodward also states that objects are material embodiment of human labor that produced them. Any object represents exploit human capacity and ultimate degradation of human creativity and identity. To investigate how a material object fit in the large social context, we could not only acquire a clear vision of what role does the object play in the large cultural and historical context but also get a clue of our relationship with the object, the nature and the society. In the 21st century, the advancement of manufacturing technology and transportation methods in the consumer society provides a platform for the consumer products and commodities grow rapidly. Traditional ways of making and designing gradually vanished in our horizon. The life cycle of an object has become shorter and shorter because people have easier access to get new objects. Fast-fashion and fast-food are dominant in our age. For my perspective, we still need to hold a rational and critical attitude towards our production and consumptions of material objects and treasure those things that really matter. Marcinkus, Andrea Kolasinski. Nature Fancywork : Women’s Discourse with Nature through Craft in Late Nineteenth-Century America, 2008. Turkle, Sherry. Evocative Objects: Things We Think With. Cambridge: The MIT Press, 2007. Woodward, Ian. Understanding Material Culture. Los Angeles ; London :Sage Publications, 2007. Edited by Maureen Daly Goggin and Beth Fowkes Tobin. Women and the Material Culture of Needlework and Textiles, 1750-1950. Farnham, England ; Burlington, VT :Ashgate, 2009. Edited by Fiona Candlin and Raiford Guins. The Object Reader. London ; New York :Routledge, 2009. Hays, J.E.S. Back In My Time: A Writer’s Guide to the 19th century. August 11, 2012. Mount Horeb — Presettlement to 1986 : a History Celebrating Mount Horeb’s Quasquicentennial. [Mount Horeb, Wis.] :Mount Horeb Area Historical Society, 1986. Romer, Grant. Portraits in the Mid-19th Century. Pbs.org. Woman and Work in the 19th Century. Striking Woman. Accessed April 26, 2016. Men’s Portrait Gallery. Gentlemen’s Emporium. Accessed April 26, 2016. Creators, Collectors & Communities by by Alyce Wang is licensed under a Creative Commons Attribution 4.0 International License, except where otherwise noted.